Information Security geek, Old School RPG nerd, and wannabe fiction writer. IMHO, this is mainly due in part to people and organizations getting motivated about secure communication after the Snowden NSA leaks. In reality, you just need cryptsetup, a line in /etc/crypttab that has the "swap" attribute and uses /dev/urandom as source for an ephemeral key (swap doesn't usually need to survive reboots), and then point your swap entry in fstab to the resulting device mapper device. See cryptsetup FAQ, 2.3 How do I set up encrypted swap, https://gitlab.com/cryptsetup/cryptsetup/wikis/FrequentlyAskedQuestions#2-setup or the CRYPTTAB(5) man page. I&apos;ve heard people kicking around ideas that would put people in charge of their data by effectively letting them rent it out to other companies, but this is the first time I&apos;ve seen anyone actually try and build it. It&apos;s an interesting concept, but I wonder if it would gain any adoption from the major players in surveillance capitalism. 1) UPnP is bad and stupid. Turn that crap off, folks. 2) looking forward to this troll getting busted and getting legally pwned. Let&apos;s see if we can get #KDE #Plasma Mobile onto a #RaspberryPi. Just another shocking fact about Global Climate Change. Android security doesn&apos;t have to be a source of stress. These level-headed steps are all you need to keep the boogeyman at bay. Anyone aware of a RISC-V SOC-system like RPi that I can buy right now? Controlling your smart phone&apos;s ability to leak information is a high priority for me. That&apos;s why I was so pleased to find Bouncer. Have a look. Decades after starting the web browser wars, Microsoft has given up its proprietary Edge web browser in favor of its open-source based rival Chromium. 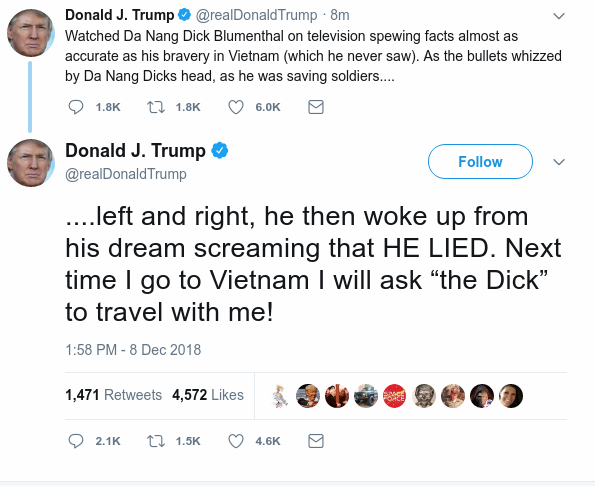 Individual-1's Twitter has been becoming increasingly unhinged for days now, but this is pretty startlingly messed up even for him. People have been openly surprised that it isn't a parody account. My money is on him sleeping even more poorly than he reportedly does, and that takes a pretty big toll on a dude with only a vague relationship with reality in the first place. Am I the only one that hopes that crypto-currency mining dies to save the planet from ridiculous wastes of energy usage?